Born deaf, TED Fellow and artist Christine Sun Kim (TED Talk: The enchanting music of sign language) uses sound as her medium, so when she saw Daniel Kish (TED Talk: How I use sonar to navigate the world) explain how he uses the echoes from the clicks of his tongue to navigate the world without sight … she was intrigued. The two of them got together to talk about how they each perceive sound, and to share their thoughts on sight and sound “etiquette.” This conversation was translated live from English to American Sign Language and back again by Dylan Geil and Denise Kahler. Christine Sun Kim: What’s your relationship with sound? How do you use it to perceive your environment? Daniel Kish: In one sense, all sound is the same, in that all sound creates pressure waves in the air. But I distinguish between “incident” sounds and “reflection” sounds — those that are made, and those that are reflected. Any sound that is made will also reflect from surfaces around it, so I hear both — but it’s the reflection of sound that provides me with a sense of the dimension of space and the objects occupying a space. CSK: You use a cane for navigation. How do you make the decision to use the cane versus echolocation clicking? DK: That’s a bit like asking, “under what circumstances would you use central vision versus peripheral vision?” The reality is that I use them both together to accomplish a wide range of tasks. Echolocation gives me a lot of information about objects that are far away or above the ground, whereas the cane gives me good, detailed information about objects that are at ground level or below ground level. Sonar doesn’t detect those very well, or at all. So I’d be hard-pressed to choose between them. People who only have central vision and no peripheral vision have a very hard time. They can read, but they can’t move around very well. And people who only have peripheral vision and no central vision can move around just fine, but they can’t read and they can’t study faces very well. I use a variety of skills, strategies and perceptions to acquire a rich, comprehensive image of my environment. CSK: Are there certain surfaces and materials that reflect sound better than others? Do you like some surfaces or textures better than others? Or do you use the contrasts to shape your world and understand your relationship with a space? DK: Precisely. It’s not really a matter of like or dislike, but a matter of what information is available. It’s true that there are materials that are less or more reflective. Hard surfaces, such as a wall, are relatively reflective; soft materials, such as furniture, are poorly reflective, so they’re more difficult to hear. But that doesn’t necessarily mean that I don’t prefer them. I do tend to steer clear of noisy environments. Christine Sun Kim, far right, in conversation with Daniel Kish, center right. The pair’s conversation was translated into American Sign Language by Dylan Geil and Denise Kahler. Photo by Ryan Lash/TED. CSK: If the material doesn’t reflect the sound well, or if, say, you’re in a space so large that it takes a while for the reflection to get back to you, do you feel a little bit less in control? DK: The echo characteristics of an environment don’t generally cause me to feel more or less in control; but the noise levels in an environment can. The noisier an environment, the more difficult it is to sort echoes out from my surroundings, such as at a noisy party. I prefer not to do it, but I am able to. It might be a bit like driving in heavy rain. People prefer not to do it, but they do what they must. CSK: Speaking of that, I was thinking about weather, too. Does rain affect the way sounds are, or if it’s hot outside or if there’s snow on the ground? DK: Yes, different environments do result in different effects. Rain covers everything with water, which is highly reflective, and it removes sound diversity from surfaces — so rain tends to make everything sound the same. CSK: Would you say the character of the sound is monotonous? DK: Kind of like that, yes. CSK: Does it make the environment kind of — boring? DK: Well, it makes it more difficult to distinguish different characteristics. So where a bush would ordinarily sound clearly like a bush, it may be more difficult to identify it when it’s covered with water. Snow has a tendency to pad things and make them sound absorbent. But at the same time, those surfaces that are not covered in snow are reflective, so they stand out. So take, for example, a tree that’s surrounded at the base by snow. The upper portion of the tree will stand out, sort of highlighted against the snow. Many blind people don’t like to travel in the snow, but when they learn flash sonar, they find it much easier. CSK: I’m curious about social norms — “sound etiquette.” Do you feel uncomfortable clicking among others? How do sighted people respond to it? DK: There’s a range. In general I find that sighted people don’t really notice the clicking. They’ll hear it if you point it out to them, but they don’t tend to hear it incidentally. Sighted people don’t tend to notice lots of sounds that blind people notice. I would expect that you notice things visually that many sighted, hearing people don’t, too. Sometimes I have to clarify this to blind people, because it can be hard for them to understand that a sound that they can always hear clearly is not noticed by most sighted people. It helps them be less self-conscious. What’s most noticeable to sighted people is how blind people visibly present themselves — how they move, their posture — and echolocation helps with that. CSK: I am very conscious of sound etiquette. When I’m sharing a hotel room with a hearing person, for example, I’m very conscious about everything from using the laptop to turning on the faucet, because I have no way to gauge the relative noise this might make and whether or not it will be disturbing. Sometimes I do have an “I don’t care” attitude, but when I’m in a larger group I become much more conscious. I’m curious about how you’re perceiving me now. You’re hearing me through my interpreter; are you thinking about what I look like? Or would you like to hear some type of vocalization from me? I’m wondering what’s going on in the back of your mind as we talk. DK: I am aware of your hand movements, and I find them quite intriguing. I am very comfortable orienting my attention and directing my attention on you as a person, even though I am hearing what you say from another direction, via the translator. CSK: Is directing your attention towards me a sort of visual etiquette, to make things easier and more comfortable for me? DK: You probably have it happen to you a lot, where someone you’re speaking with directs their attention to your interpreter. I have it happen a lot, that if I am with someone, someone else we encounter will often direct their attention to the person I’m with, rather than to me. So I understand very well the misconception that leads to that mistake. CSK: Yes, you’re right. Absolutely. What about touch etiquette? I have some friends who are both deaf and blind, and they may physically grab onto someone’s arm as a way of communicating. But in general, in this culture, touch is not really accepted or encouraged. I’m wanting to reach out and touch you — but I’m wondering what your usual preference is? Is that something that you’re OK with, or something that’s not appropriate? DK: I think that is something that’s worked out between two individuals, though of course it’s influenced by culture, as all human interaction is. A lot of blind people would have conducted this entire interview facing straight ahead. Or maybe even with their head down. On a stage, I’d say the majority of blind people would stand exactly in one place and just looked straight ahead. Blind people often fall into this “wooden neck syndrome,” where their heads are fixed straight ahead, and so they’re not really engaging people. It looks unnatural, and yet I would say it happens that way most of the time. The unfortunate part is that blind people are not learning visual social engagement. I suspect that a lot of the reason people appreciate me as a speaker has as much to do with how I present physically and visually as with what I say. I think it would be a very different experience if I didn’t physically engage the audience when I speak. I think a lot of people would feel disconnected from me. CSK: I do the same thing, but in the opposite way. Sometimes, when I’m giving a speech to a group, I lessen my facial expression when I sign, toning it down to make myself a little bit more presentable. In rehearsals, I’ll ask my interpreter, “What’s the tone I’m giving out?” I want to look hearing-friendly to the audience, if that’s the term? So I know exactly what you’re doing, but I do that in the opposite way. I wish I could just be myself, but I want to connect with people, and to do that, I have to understand their culture, and their vision and sound etiquette. I can actually be quite a loud person. Last week, I got a note from my neighbor who lives upstairs, complaining that I’m too loud when I arrive home — when I open and close the door, when I walk around. I thought, “But I’m at home.” I want to be myself completely, feel free to do what I want to do. But even at home, I guess the floor makes a lot of sound and reverberates. DK: Yes. It would be a bit like me being concerned about the colors I wear. I have no concern whatsoever about it, but I know that other people do. So I have a color identifier in my phone that tells me what colors I’m wearing. I had someone go through my closet and get rid of all of the busy colors, anything printed or with stripes, because I’m on camera a lot. I’ll tell you a funny story: one time I showed up to a formal occasion and I had a nice collared, button-down shirt, and I wore it. It was the only shirt I brought with me. I started to approach the venue, and a friend of mine laughed good-naturedly and said, “Oh, I really like your shirt!” And I kind of laughed and said, “Why do you like my shirt so much?” And she said, “I like all the palm trees!” So I was wearing a Hawaiian shirt covered in brightly colored palm trees to a formal occasion. They all laughed because they know I’m from California, and Californians are a bit strange, so no one really took offense. Karen Frances Eng is a contributing writer to TED.com, dedicated to covering the feats of the wondrous TED Fellows. Her launchpad is located in Cambridge, UK. 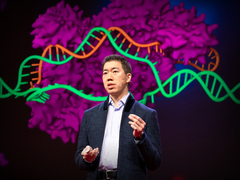 Can we cure genetic diseases by rewriting DNA? A walk with Daniel Kish, who navigates the world using "flash sonar"